The globally acknowledged study led by Dr Mahesh Desai shows the potential effects of a lack of fibre on the intestinal flora. It is common knowledge that people can become rather irritable and even aggressive when they are hungry. Yet it was not known until now that the same goes for intestinal bacteria, which can also become quite aggressive when deprived of nutrients. “We have discovered that intestinal flora becomes angry when given less dietary fibre,” explains Desai. And it is the intestinal mucosa that must bear the brunt of this anger. 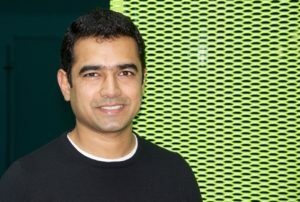 Dr Desai is the head of the Eco-immunology and Microbiome research group at the Department of Infection and Immunology at the Luxembourg Institute of Health. Together with Dr Eric Martens of the University of Michigan Medical School, he carried out a study in which the functioning of the human digestive tract was simulated. The two researchers investigated the behaviour of certain bacteria in a living organism under controlled conditions using mice that had been born and grown without intestinal microbes before having a transplant put in containing a cocktail of 14 different bacteria. Dr Desai and Dr Martens noted that when deprived of dietary fibre, intestinal bacteria altered their survival strategies and began to eat the intestinal mucosa. They also observed that the bacteria cannot be stopped from doing so even if the host is given additional conventional prebiotic food supplements – a fact also demonstrated in other studies. Dr Desai considers the results of this study to be crucial because they form the basis for the development of next-generation prebiotic food, as well as to understand disease pathogenesis mechanism. The results may also contribute to the development of successful treatments for irritable bowel disease, intestinal cancers and other digestive tract diseases. The fact that these results were published in the renowned journal Cell in 2016 demonstrates the significance of the findings for medicine. “This is a great honour for us and for Luxembourg,” says Dr Desai, currently studying the processes in the intestinal mucosa with scientists at the Riken Center for Integrative Medical Sciences in Tokyo. One thing the researchers are aiming to find out is how the destruction of the mucosa together with organic acids and short-chain fatty acids increases sensitivity to certain intestinal germs, such as Citrobacter rodentium. This three-year collaboration has been made possible by the FNR’s INTER Mobility programme. Dr Desai has obtained an FNR AFR Bilateral grant with the Japanese institute, where he is one of the PIs. This grant involves several researchers from Luxembourg Institute of Health, Luxembourg Centre for Systems Biomedicine and scientists at RIKEN institute. This is not the first time the FNR funding has supported Dr Desai in his research. During his previous work at the Luxembourg Centre for Systems Biomedicine at the University of Luxembourg, the research group leader worked on another INTER Mobility programme studying how a dynamic supply of certain carbohydrates (glycans) affected the intestinal flora. As well as the current INTER Mobility grant, his above-mentioned work to develop prebiotic food to prevent intestinal diseases is also being funded as part of the FNR CORE programme. Funding researchers based in Luxembourg for a mobility period at leading research institutions abroad, or excellent researchers from abroad to integrate Luxembourg research teams (mobility periods up to 1 year).